Gosh I love spring! It's the season for colors and pastels and Reese's eggs...and it's also the season for awesome fabrics like eyelet and linen. Honestly, spring is one of the best fashion seasons, in my opinion. It's time of rid ourselves of our winter dark color slump and bust out the colors! 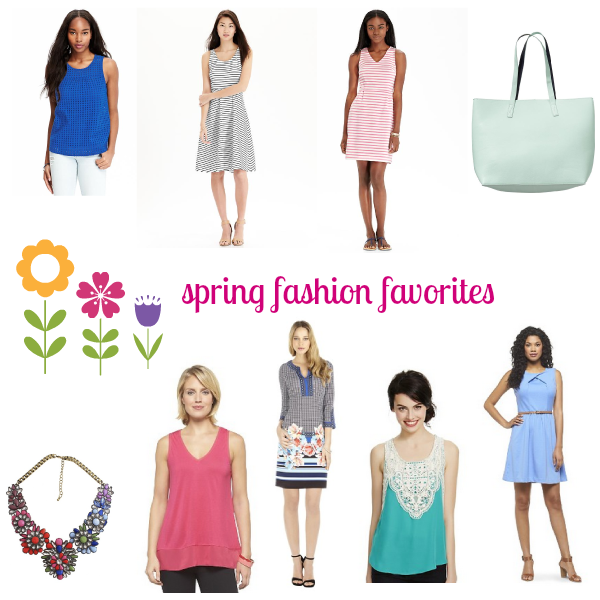 Here are some fresh and springy items from a few of my favorite stores. The top row is Old Navy and the bottom row is Target. Links and commentary are below. Eyelet Lace Top | Wear to work with a cardigan and pants/skirt or wear casually with a skirt or jeans/shorts. Navy Ponte Knit Tank Dress | Wear to work with a cardigan or blazer or wear casually with flats or a denim jacket. Pink Ponte Knit Dress | Same as the navy one. But this is fit a little differently so it comes across a bit more formal. Reversible Tote | This is large enough to be functional as a tote and to carry things but could also serve as an everyday purse. Multi-colored Bib Necklace | Wear for all occasions! Trimmed Knit Shell Top | Wear to work under a cardigan/sweater/blazer or by itself for a casual look. Patch Floral 3/4 Sleeve Dress | Wear by itself! Flats for work and flip flops/sandals for play. Crochet Front Tank | Wear by itself for a casual look or pair with a denim jacket or cardigan. Ponte Fit and Flare Dress | Wear by itself for work or play!